"You are in a familiar space - with trees, broad meadows, an occasional house and drifting clouds in a soaring sky. It's a place where color is free to be anything you want it to be - free of the usual expectations - and your eyes can reorder the forms and play with the colors and come to whatever conclusions they want. The freedom of color and form in a Raka Bose Saha painting is anything but accidental or arbitrary. The subtle pairing of complimentary colors and the contrasts of lights and dark, along with the variation in colors and value, allow the forms to come alive in a landscape of well thought-out ideas. Raka believes the essence of beauty is the idea, and the vehicle of idea is the form." - Jim Magner, Capitol Hill artist and writer. Capitol Hillrag, Washington, D.C.
“My paintings are very personal reactions to what I see; they are visual expressions of my thought processes; they are not direct illustrations of the nature. I try to resist seductive details in favor of imagined patterns. Color and composition are the two most important elements in my painting. I spend more time contemplating the composition of my painting than actually painting it. I do not like to distort forms, but I enjoy unrealistic colors; that is when my works become abstract. I often like to paint on a square canvas, this shape adds to the abstractness of my realistic forms. I feel square is like a block out of the main theme, so it gives the impression that there is more than what the eye can see. I believe that art must show a certain beauty, and the essence of beauty is the idea; the vehicle of the idea is the form. At this point in time, my forms are realistic, the color and compositions are abstract. I want my work to be understood by the layman and the cognoscente." Raka has an MS degree from the University of Michigan at Ann Arbor, and a MSc degree from the University of Calcutta, India. She has been painting since she was five years old. She has lived and traveled extensively in Europe, India, and North America. She lived in Italy in 1980 with her family for one year and studied art independently. When her son graduated from University in 1994, she gave up her job as a Biochemist and a Microbiologist and started painting full time in her studio in Georgia. In 2003 she moved her studio to Maryland, where she continues to live with her family today. Raka’s work has been accepted in and received awards from several national and regional juried exhibitions and museum shows. She is a Signature member of the National Watercolor Society. She is also an Exhibiting Member of the Georgia Watercolor Society, Member of Excellence of The Atlanta Artists Center, Permanent Member of the Fine Art Section of the St. Louis Artist Guild, and an Exhibiting and Solo Artist Exhibiting Member of the Art League of Alexandria, Virginia, located at the Torpedo Factory. 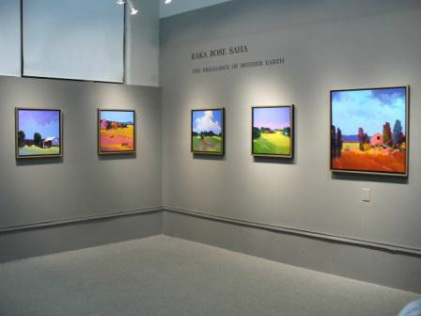 Raka has had several one person exhibitions in Alabama, Georgia, Maryland, Missouri, Virginia, Washington, DC, and Montreal, Canada. Her paintings are in private and corporate collections in Alabama, California, Georgia, Illinois, Maryland, Missouri, New York, Texas and Virginia, and internationally in Canada, England, India, Italy and Switzerland. Collectors include Steven Edison (Edison Brothers), Dr. Louis Fernandez (VP Monsanto Company), Dr. Edward Macias (Vice Chancellor Washington University), Zales Jewelers (St. Louis), J. Scott of Coca Cola (London, England), Bank of America (Atlanta). Raka's work has been featured in "Best of Watercolor: Painting Color" by the Rockport Publishers of Massachusetts (#1-56496-349-7; January, 1998). She has also been featured in various journals including the St. Louis Business Journal and Journal Montreal Serai. No image may be copied or used without permission from the artist.